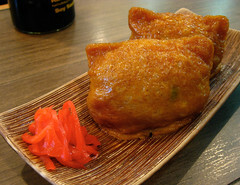 Fatty tofu pouches filled with lightly vinegared rice. So in the last month or so, Manpuku introduced some new items to the menu. While we haven’t quite gotten through them all, one tasty and notable snack was Inari Sushi, a fat tofu pouch of vinegared rice, lightly sweet and just warm. Really tasty and clocking in around $3 before tax for a pair. Comes sided with an optional mound of pickled ginger.